Would you like to explore part of the Wolli Creek Valley? Then join us for an enjoyable, leisurely Sunday morning bush walk in a remarkable natural part of Sydney’s inner south west, and find out more. On Sunday 3 June we will walk from near Bexley Rd, Bexley North, to Turrella. We will be starting at 9am sharp. This walk will traverse a part of the Two Valley Trail (TVT), which in its entirety is a 13 km walk along the Wolli Creek and Cooks River Valleys. Your walk leaders will share their knowledge of this bushland, its cultural and environmental history, as well as information about the current issues facing the Wolli Valley and the bush regeneration (Bushcare) work the Society is undertaking. Registration is essential. The walk is free to Wolli Creek Society members (Membership is $10 pa for an individual & $15 for a family/household.) By arrangement, you can join on the day, however as numbers are limited and there is always keen interest, preference will be given to those who have joined WCPS ahead of the day. 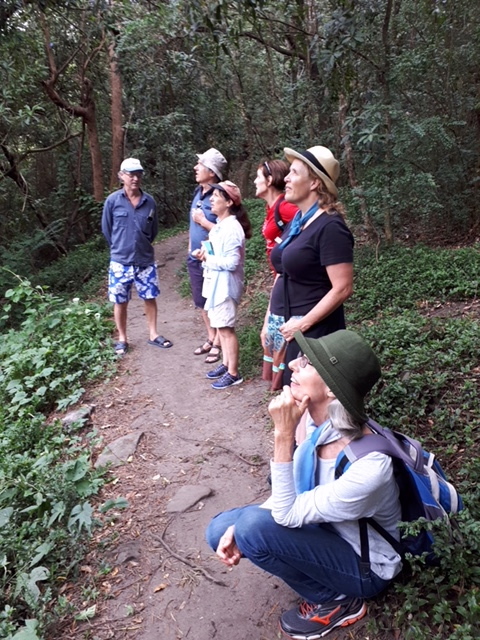 Walkers viewing the Grey-headed Flying foxes roosting near the Two Valley Trail in the Wolli Creek Valley.